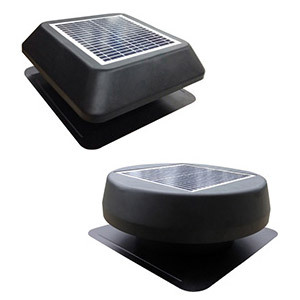 Like traditional attic fans, Optimum Sun Power Ltd's solar roof exhaust fan removes hot, stagnant air from your attic and allows your air conditioner to more efficiently cool the house. 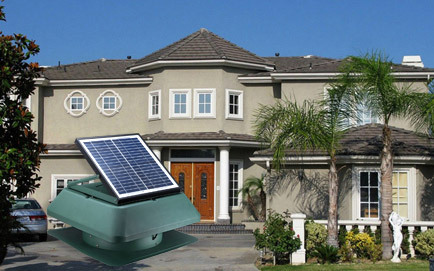 What makes our solar fan even better is that it requires no public electricity, that means not only are the attic fan's operational costs zero but your installation works are easier. Our solar fans blend seamlessly into your roofline and are extremely quiet, if it wasn't for the energy savings, you might forget they are there. Taking advantage of the free & clean solar energy, this roof exhaust fan will pump out the interior heat & moisture to balance your house temperature, so as to provide a refreshing ventilation and more environmental-friendly surrounding, and to lower down your general power consumption cost. Being exposed long to the strong sun, your roofing underlayment may go weak and even lose efficiency under the very high temperature. This roof ventilator can help reduce such heat to prolong their lifespan and to help you save certain maintenance or replacement fee. When collided with chilly attic-roof in winter, the interior warm & humid air will condense into water droplets, such saturated humidity might cause dangerous electrical short circuit or create mildews to harm your plasterboards. An adequate & more active indoor ventilation provided by this exhaust fan can help remove these moisture contents & harmful elements for you. 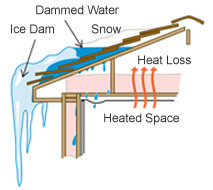 In snowy winter, interior warm air could melt those snows at roof to generate droplets falling down to the eaves. 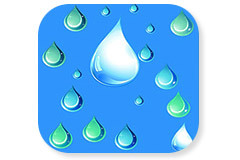 These droplets will then refreeze into ice damming on your roof and arousing dangers, this solar ventilator can help preventing such unsafe factors through keeping the indoor environment dry. Patented Air Draft Design, for a Higher Efficiency! Our patent-designed turbine wind guide blades structure is adopted in this ventilator.Following a 360-degree swirl ventilation mode and being free from outside airstream interferes, it can work efficiently in sunny days to exhaust out the indoor heat & smell and not let any exterior air going in, so as to keep the living & working environment always clean & fresh.In raining windy days, this air draft design can also efficiently prevent the rains or winds from flowing backward. 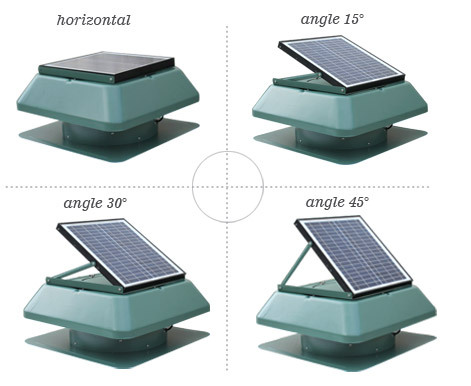 This roof exhaust fan carries a horizontal adjustment platform design for the solar panel to rotate left or right and face towards the sun, this rotation can be as big as to 90°. that is 0°, 15°, 30° & 45°. 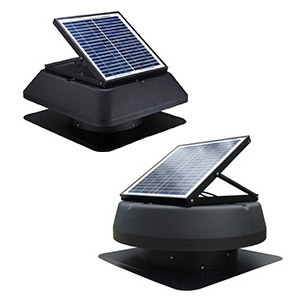 To assist our solar exhaust fans be working excellent also in special environments like greenhouse / water tank where its surrounding is very humid, we've self-developed a brushless dc motor that is IP68 waterproof, and its quality can be guaranteed even by dipping it into water for tests! 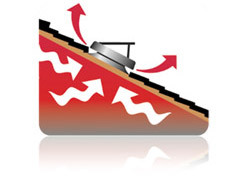 The solar photovoltaic effect defines any solar exhaust fan can run only in sunny day time. But to think outside the box and extend product's work time, we've uniquely developed 2 SIPL solutions: solar fan with solar battery system & solar fan with AC/DC power adapter to achieve 24 hours nonstop running of our solar exhaust fans! 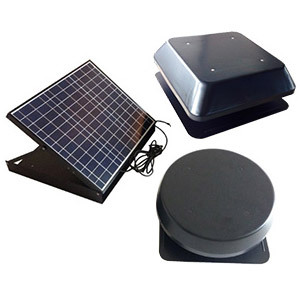 The initial installation purpose for such solar roof exhaust fan may be to take out heats from a residential house, and they have been widely used in pitch roofed buildings like villas. Besides villas, other structural buildings with flat roof have actually become great and new platforms to utilize such devices. 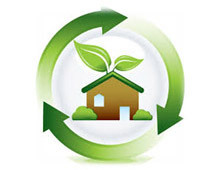 For a more extensive application, such solar roof exhaust fans would be good devices also for industrial, agricultural, animal-husbandry, as well as those portable container houses. When to define by the size of fan blades:, we have 12'' designs (6 models) and 14'' designs (12 models), and every model can add accessories to extend product functions!